Put your slides, movies, photos, and everything else that fills your iPad 2 screen on an even bigger screen — your HDTV. 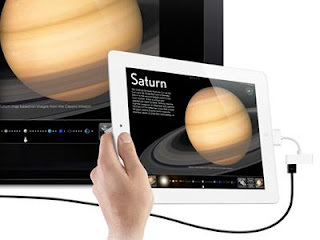 The Apple Digital AV Adapter mirrors exactly what you see on iPad 2 so that everyone in the room can enjoy it on your widescreen TV, video projection screen, or other HDMI-compatible display. The Apple Digital AV Adapter also supports video out for iPad, iPhone 4, or iPod touch (4th generation).